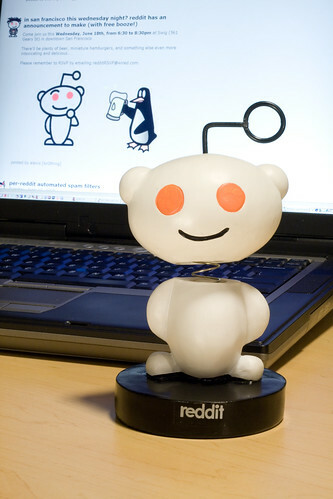 My new reddit alien bobblehead. Acquired as swag at a reddit party in San Francisco. This was done without a strobe. Key light was a ceiling-mounted fluorescent. Fill was from a silver reflector disc just out of frame camera left. The tricky part was getting the LCD to have a reasonable color match. Doing it in post-production would have been messy, so I fiddled with the Nvidia color-correction settings on the laptop until I got something that looked reasonable straight out of the camera. To my eye, the screen looked greenish-orange. To the camera, it appeared just slightly blue.